My card, "You Are So Thoughtful", was so easy to put together. I chose coneflowers for this card and I created them using vellum. I used one of the new tags twice on this card...one is right side up and one is upside down. The tags are so versatile, they bring creating to a whole new level. Card size is 6 x 4 3/4”. Cut two pieces of pearlized cream cardstock 6 x 4 3/4” and 6 1/2 x 4 3/4”. Score the larger piece at 6”, fold tab and adhere to the 6” piece to create a hinged tent fold card base. Cut a mat layer from gold mirror cardstock 5 3/4 x 4 1/2” and a top layer from cream pearlized cardstock 5 1/2 x 4 1/4”. Adhere the top two layers together with dries clear adhesive and then adhere to the card base with foam tape. Diecut the decorative label from the Ornamental Tags Die two times from Cream pearlized cardstock and two times from Gold Mirror Cardstock. Adhere the cream to the gold, offset just slightly. Adhere the decorative labels to piece of cardstock 1 1/4 x 3”, one right side up and one upside down as shown and adhere to the card base as shown. Cut a piece of gold mirror cardstock 1 1/2 x 3 1/4”. 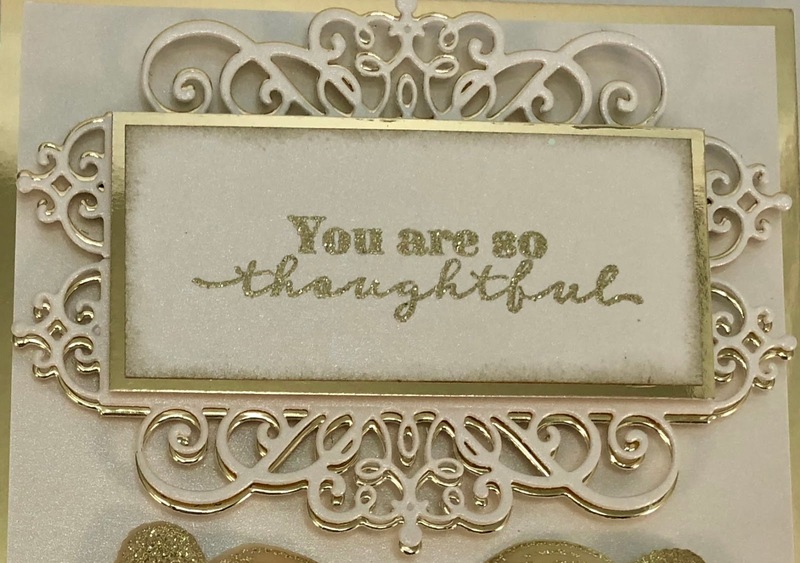 Stamp the sentiment on a piece of cream cardstock 1 3/8 x 3 1/8” with VersaMark, sprinkle with WOW Metallic Gold Sparkle Embossing Glitter, heat set with heat It tool and ink the edges with Metallic Gold Ink. Adhere to gold mirror cardstock with dries clear adhesive and adhere to the decorative labels with foam tape. 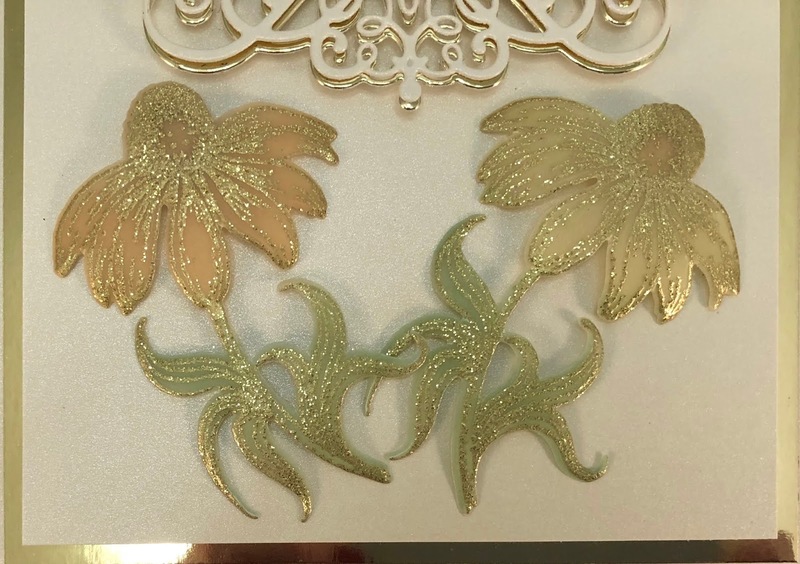 Stamp the Coneflowers on Rajni Chawla’s Flowerite Vellum with Versamark, sprinkle with WOW Metallic Gold Sparkle Embossing Glitter, Heat set and diecut with coordinating die. Color the coneflowers with Archival inks; Olive, Sunflower, Tiger Lily and Coffee using Stack and Store Daubers. Shape lightly using the Deluxe Flower Shaping Kit and adhere to the card base as shown using dimensional dots and dries clear adhesive. 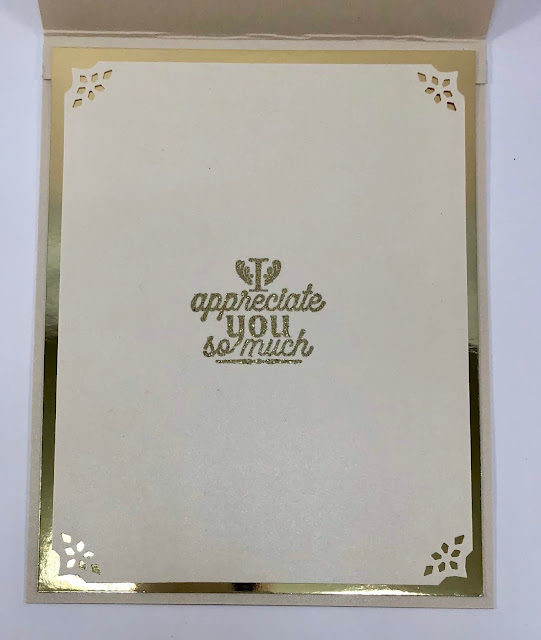 Inside: Cut a mat layer from gold mirror cardstock 5 3/4 x 4 1/2” and a top layer from cream pearlised cardstock 5 1/2 x 4 1/4”. Use a corner punch on the cream layer, adhere the layers together and adhere to base using dries clear adhesive. 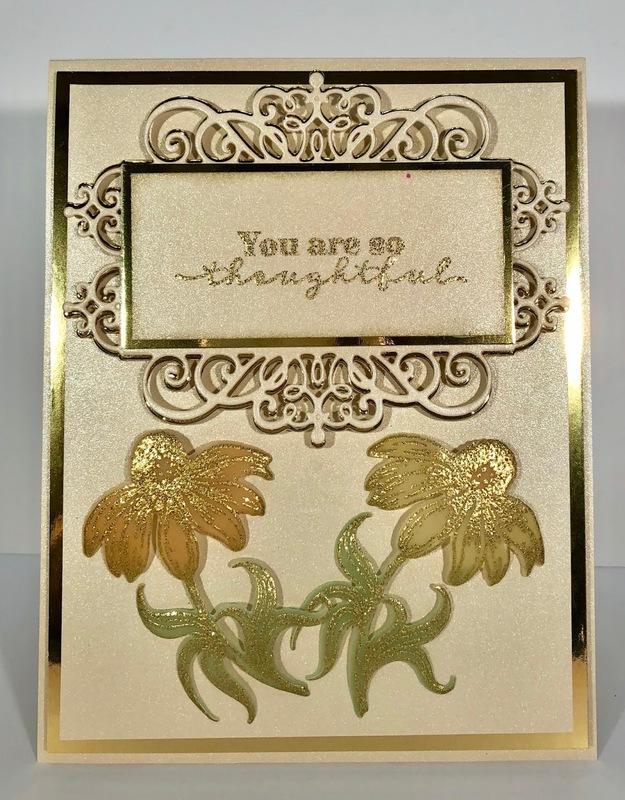 Stamp the sentiment using VersaMark, sprinkle with WOW Metallic Gold Sparkle Embossing Glitter and heat set. gorgeous projects created by the fabulous design team. I really appreciate your visit...have a beautiful day! This is just lovely! I love how elegant it turned out! Wow, your gold layers are so elegant!! Beautiful card my sweet friend! !